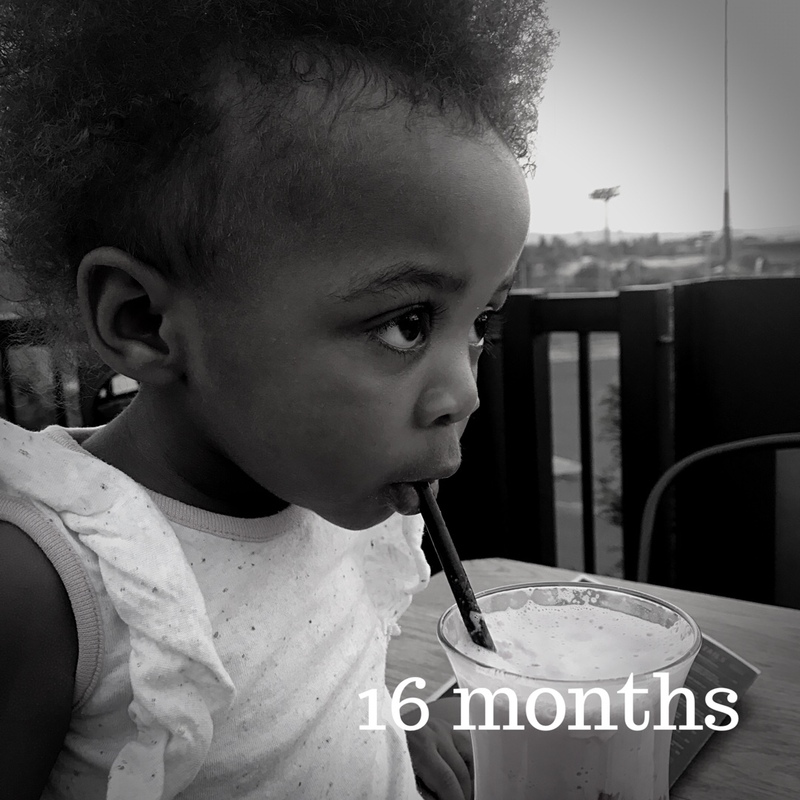 Today Amari Mambo turns 16 months. We speak more now and our vocabulary includes: mama, daddy, dada, bath, bhabhu, dirty, nana, gogo, rub-a-dub-dub, purple, two and bye. Not bad little one! We have moved very firmly from size 1 shoes into size 2 with no socks and 3 with socks and are finally in the same range for clothing as our age- 12-18 months. Though she can still fit into some of her 6- 12 month clothes, they are just all short. Amari loves books and reading, she loves running and taking looooong walks outside. She loves carrying her chairs all over- including around the yard. She loves rides in her stroller and never passes up a chance to get some of that action. She loves box juice and water and custard. She is eating meat again after about a 2 month break from it. She can be seen very often around dinner time with a chicken or oxtail bone in hand. We are still breast feeding and Mambo has for two months now been quite resourceful in that she can get her milk herself. 90% of the time she is interested in milk, she literally reaches into her mom’s bra and organizes herself. MamboD had an incredibly busy month between August and September. I wrote about the wedding in Lusaka, well since then Amari made a trip to Zimbabwe to attend her very first memorial service for her Sekuru Dan. She participated in the candle lighting ceremony for her Sekuru, but of course, safety first- she tried to blow out the candles. Mambo you are the cutest! She had a chance to meet her Sekuru Jasper which was probably more emotional for her mom than her. Mambo attended her beloved Aunty Tusha and Uncle Mutsa’s wedding. What an incredibly blessed baby! She looked stylish in her dress that came all the way from Aunty Tamala. What an incredible ceremony it was! We are so glad that Amari can share in these moments of absolute love and affection. What an honor! Let’s do it again. What a fantastic time we had seeing so many people. Amari finally met some people who are ever important to her mom- Tafara, Zanza, Seli, Upi, Getsi and Penny, Norm, – I could continue, but it would take a page. It was so amazing that everyone could finally meet this bundle of energy! We even met some new friends in Tux and Jess who are absolutely beautiful. Most notable this trip was that Amari finally met her great grandfather/ uncle- Sekuru Aaron. Wow! This trip to Zimbabwe was incredible! We look forward to more… And more… And more. After all the traveling, we are happy to be home- though not as much as Amari is. She has fast outgrown most of her toys and is now taking to painting and drawing. I am not sure if we will ever have some wall drawings from our young Picasso or not, we will see. Amari still loves dancing and breaks it down whenever she hears a tune that moves her spirit- and her little legs. Mambo went to another birthday party, this time to sing for Ruva who turned 2 just a few days ago! Our little social butterfly seems to be a little clingy these days, which mommy thinks is due to the amount of traveling, let’s see how the next few weeks go, shall we? It has been a month FULL of activity, love, progress, happiness, love, tears, walks, sunshine, love, A LOT OF LAUGHTER and family- did I say LOVE? We thank you all so much and we love you dearly, thank you for sharing so much of our lives. Next Muvaki is here: Part 1- Amari, you are a big cousin now.